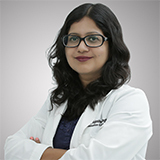 Dr Tejashree Singh has more than 15 years’ experience in the field of Obstetrics and Gynaecology with Minimally Invasive Surgery, Infertility & Pregnancy Care being her main interests. Education: Dr Tejashree received her M.B.B.S. degree from Bombay University in 1998. She went on to receive her MD in Obstetrics and Gynaecology in Feb 2002 also from Bombay University and DNB from the National board in Oct 2002. She was trained in Endoscopy and ART in Sir Gangaram Kolmet hospital in New Delhi from 2004-2005, following which she joined the hospital as Associate Consultant for 8 years. She obtained her Advanced Training in Minimally Invasive Surgery (MIS 2) and ART from Germany in 2010. She obtained her Gynaecology Laser diploma from SULTARC, UAE in 2015. Clinical expertise: Laparoscopic (Key Hole) Surgery for Fibroids, Ovarian cysts including Dermoid cyst, Endometriosis, Tubal Recanalization, Hydroslpinx, Pelvic Adhesiolysis for Fertility Enhancement, Ectopic pregnancy. Hysteroscopic Surgery for Fibroids, Polyps, Uterine Septum, Ashermans Synechiolysis, TCRE & endometrial ablation for heavy menstruation. Pregnancy Care, Delivery, Post Pregnancy Care, Management of Recurrent Abortion cases. Research / Publications: Clinical profile of PCOS subjects, health implications & long term management (2009), Risk of Endometrial hyperplasia & Cancer in PCOS (2011), Low Molecular Weight Heparin therapy in improving pregnancy outcome in patients Bad Obstetric History (2010), Hyperandrogenism (2008), Hysteroscopic myomectomy, polypectomy, guided biopsy (2009), Ectopic Pregnancy-Current Management (2010), Laser Vaginal Rejuvenation (2014), Hysterosalpingo-foam sonography (HyFoSy): A new radiation free technique to visualize Tubal Patency in an office setting (2015). Languages Spoken: English, Hindi, Marathi, Basic Arabic, Urdu.